Fabrication of optical semiconductors, much like other types of semiconductor products, follows a well defined manufacturing flow. In broad terms. this begins with specialized wafers onto which the devices are patterned. The finished wafers (examples in the image above) are tested, cut into individual chips (“die” or “dice”) which are then assembled and packaged into the final product. These undergo additional inspection and testing before they leave the factory for customers. 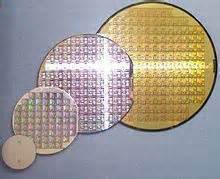 Below is a more detailed description of each of the steps and processes that go into the transformation of silicon wafers to finished optical semiconductors. Thin films of compound semiconductors are deposited or epitaxially grown on a substrate made of semiconductor materials or insulator like GaAs, InP, GaP, Sapphire, or SiC, and optical and functional devices are created on these substrates. The substrate thickness is 0.25-1.0mm with a diameter of 2 to 5 inches (50 to 100mm), and the film is usually grown to a thickness of about 0.05-0.2mm. The substrate shape is usually round and so is called a wafer. Once the wafers are prepared, a multi-step sequence is carried out to create the desired semiconductor devices. In general, optical semiconductor fabrication is grouped into two processes: the front-end process and the back-end process. In the front-end process, wafers are engineered, and in the back-end process, they are separated into individual elements or chips, and finally all the qualified chips are assembled into packages. In the testing process to monitor each stage of serial processes, sampling or total inspection is conducted in accordance with procedures to administrate and control the processes and quality for a ultimate guarantee of quality. The front-end process refers to the formation of the light-emitting and photo-detecting elements directly on the silicon or compound semiconductor wafer and provides a process flow in the procedure below. Design the functions and structures of some elements, according to customer demands. Design and fabricate a photo-mask to transfer thousands of patterns of some element onto a glass plate. Create thousands of elements on a wafer. through the processes below. The abovementioned steps are repeated to fabricate elements according to the process flow chart. Make ohmic contacts with the p or n region, and, in an optical semiconductor element having polarity, the anode is the positive (+) electrode and the cathode is the negative (-) electrode. Electrical performance is proved on a test machine, so-called a prover. This process is also known as wafer proving or wafer sorting test. All of individual elements connected on a wafer are subjected to such an electrical test for functional imperfections and are determined as good with meeting the requested specifications. The back-end process consists of 4 steps: wafer mounting, die bonding, wire bonding, and packaging. Mount a whole wafer onto an adhesive tape and attach it onto a ring before breaking it into individual pieces. Cut a wafer containing thousands of elements into individual pieces, each called a die. Mount or fix a die into the package or some substrate; also called die attachment. Make interconnections between a die and the exterior of the package or substrate. The wire is attached at both sides by using some combination of heat, pressure, and ultrasonic energy to weld each end. Check visually die location, epoxy paste, and wiring. Such optical semiconductor devices are subject to a variety of qualification test for electrical characteristics to verify whether they function properly. The proportion of optical devices found to perform properly is referred to as the yield. Kyosemi Corporation is a dedicated manufacturer of optical semiconductor devices as above mentioned. The company has established an integrated production line covering successively front-end to back-end processes. Front-end processes are carried out mainly at the Eniwa Plant in Eniwa City, Hokkaido, Japan. Back-end processes are continuously carried out for mass production at the Eniwa Plant, but some of them are transferred for further cost reduction and mass production to the Kamisunagawa Plant, in Kamisunagawa-cho, Sorachi-gun, Hokkaido, Japan. Both plants are located at Northern Part of Japan.